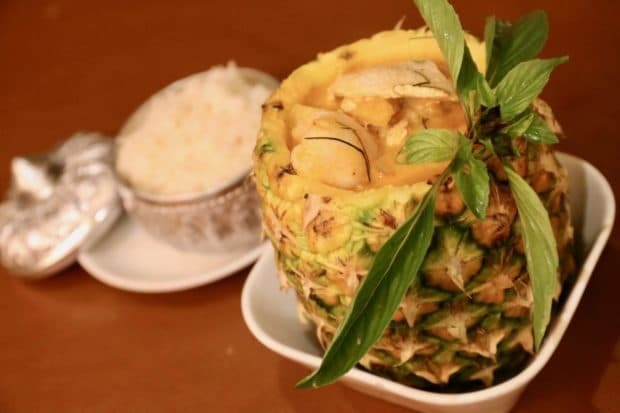 Mengrai Thai is considered to be one of the best Thai restaurants in Toronto. 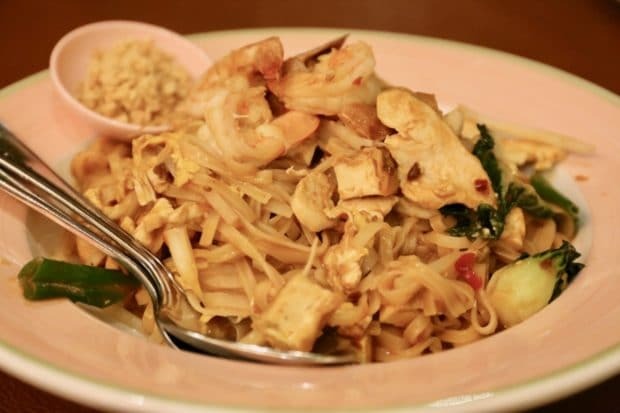 The popular Asian restaurant in Toronto is the perfect place to enjoy your favourite dishes from Thailand such as pad thai, tom yum soup, spicy coconut curry and spring rolls. Step inside Mengrai Thai restaurant in Toronto. Mengrai Thai first opened its doors in Toronto’s King East neighbourhood in 2008. Chang Mai dining room at Mengrai Thai in Toronto. Mengrai Thai is located in a historic building in Toronto, which was once a brewery back in the 1920s and 1930s. Since then the beautiful heritage building has also played home to an art gallery and mannequin factory. The restaurants interior is filled with arts and craft inspirations from Thailand. Skip through the restaurants three dining rooms and you’ll find yourself transported to a bustling market in Chang Mai. 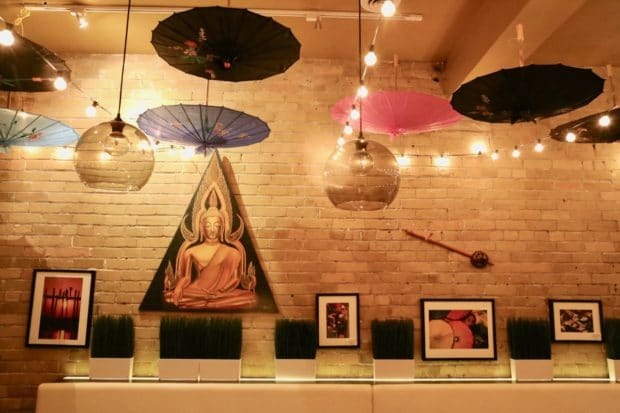 You’ll find smiling golden Buddha statues, upside down multi-coloured umbrellas hanging from the ceiling and classic Thai triangle pillows that fold out on comfy bench seats. The Four Faced God shrine in the middle of the main dining room was placed here by Chef Sasi Meechai because she sensed a flow of energy going through that part of the restaurant. 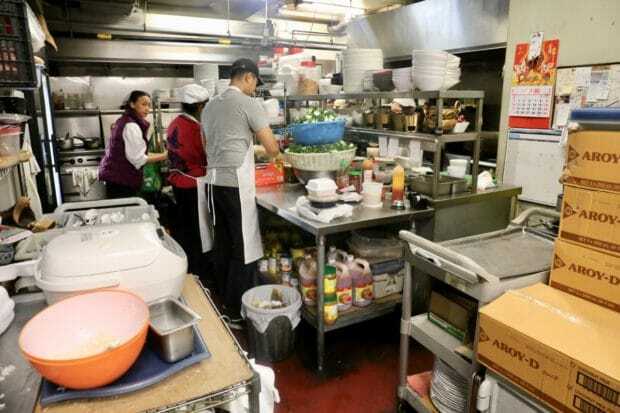 The Thai restaurants bustling kitchen. 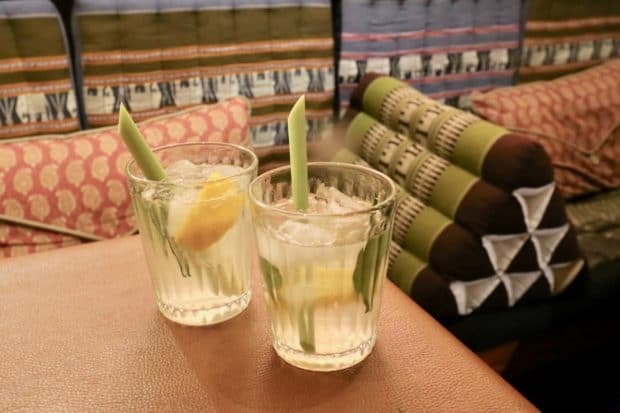 Lychee and kaffir lime leaf cocktail at Mengrai Thai. Mengrai Thai’s Chef Sasi Meechai grew up in a small village called Wiang Pa Pao, which is located in Chiang Rai Thailand. She moved to Canada in the mid 90s. 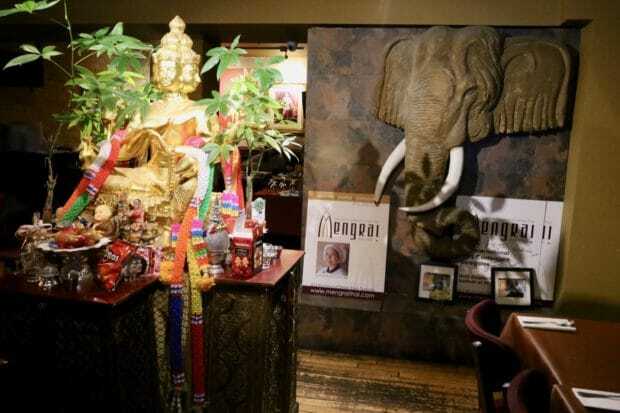 Today, Chef Sasi prepares traditional dishes from northern Thailand at Mengrai Thai restaurant in Toronto. Chef Sasi’s Mengrai Thai menu has been enjoyed by visiting A-listers such as Drew Barrymore, Jessica Alba and Mick Jagger. 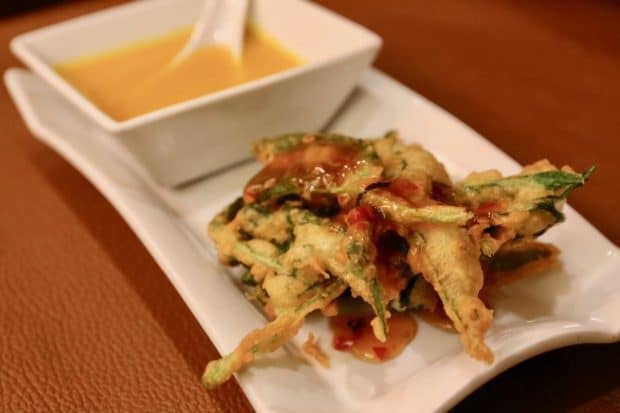 Crispy Morning Glory with Golden Pumpkin Soup at Mangria Thai. Royal Lemongrass Coconut Soup: coconut broth, thai ginger, kaffir lime, basil, chili, tamarind, tomato, mushroom, onion, roasted scallions. 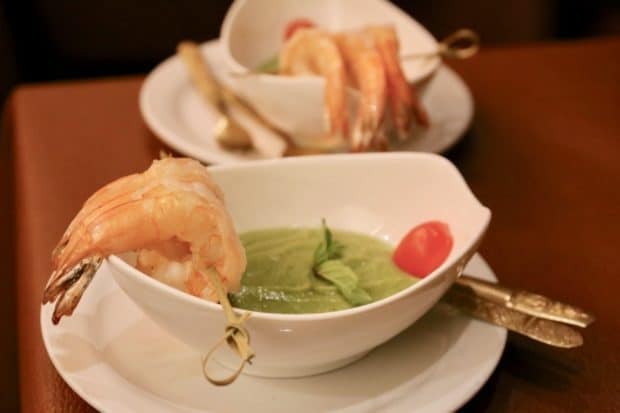 Green Goddess Avocado Shrimp: poached shrimp with avocado coconut mousse and green curry. Green Goddess Avocado Shrimp at Mengrai Thai. Royal Thai Pineapple Fried Rice: fresh pineapple, soy, garlic, peas, carrots, scallions, and cashews. Thai Fried Rice: soy, garlic, peas, carrots, onion, roasted scallions. Pad Swoon Sen Glass Noodle: egg, soy, garlic, bean sprout, green onion, bok choy, and dried scallions. Original Pad Thai: tamarind, egg, soy, garlic, palm sugar, ground pepper, cayenne, bean sprout, green onion. Chef’s Pad Thai: chili bean shrimp paste, tiger shrimp, chicken, tofu, egg, garlic, tamarind, green onion, bean sprout, and peanuts. Classic Pad Thai at Mengrai Thai restaurant. Regal Red Curry: coconut broth, yellow ginger, coconut, baby corn, eggplant, bamboo shoot, kaffir lime, garlic, galangal, lemongrass. Emerald Green Curry: Mengrai Thai’s spiciest curry with garlic, coconut, baby corn, eggplant, bamboo shoot, kaffir lime, garlic, galangal and lemongrass. 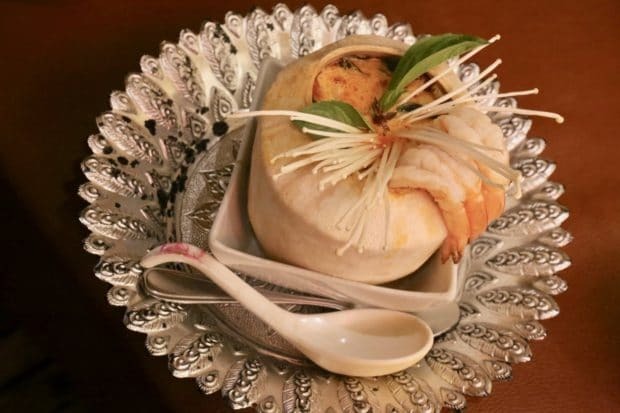 Andaman ay Jumbo King Prawns: Panang curry sauce with crown of sticky rice. Red Chicken Curry with Lychee at Mengrai Thai. Ginger Stir Fry: ginger, sweet bell pepper, mushroom, bok choy, soy, garlic. Cashew Stir Fry: seasonal greens, sweet bell peppers, boy choy, nappa cabbage, soy, garlic, onions. Garlic Shrimp: caramelized fresh pineapple, sweet soy, garlic, and green onions. Basil Stir Fry: seasonal greens, boy choy, napa cabbage, basil, soy, garlic, onions. Royal Lemongrass Coconut Soup with Shrimp. Chinese Broccoli with Shitake Mushrooms: soy, garlic, shitake mushrooms, tofu, mushroom sauce. Stir Fried Basil Eggplant: sweet basil, tofu, soya, garlic, onions. Crispy Tofu in Cashew Garlic Sauce: onion, sweet bell peppers, tangy soy garlic tomato sauce. Vegetarian Delight with King Mushrooms: stir fry with greens and tofu in a mushroom soy garlic sauce. 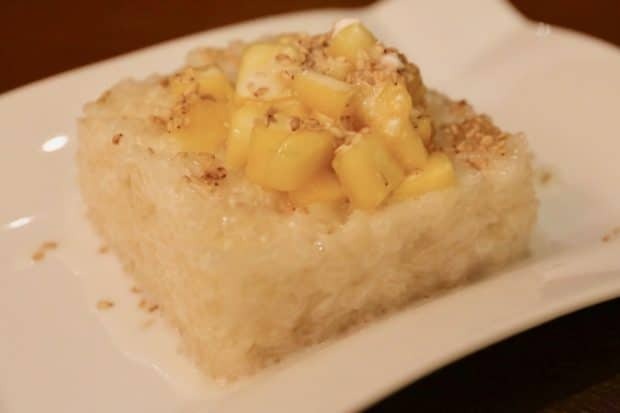 Thai Sweet Coconut Sticky Rice with Fresh Mango. Excellent review and coverage!! Accurate and really reflects the amazing atmosphere, people and food. Thank you for highlighting what I believe is the best restaurant in Toronto.. and my personal favourite restaurant! Chef Sasi, Allan and Brandon deserve rich accolades and will always warmly welcome new and long time customer/foodies alike.